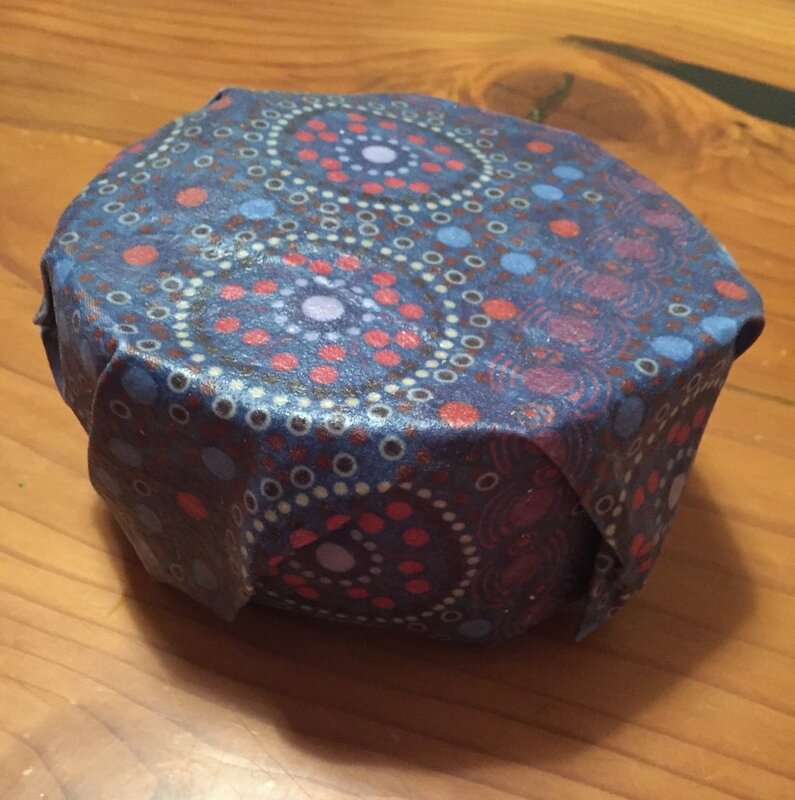 Someone asked recently in a local small business owners group if anyone knew where one could find beeswax wraps. A few people piped in with some Portland-area shops, but one person commented, "I just make them! Super easy!" Intrigued, I used the Google and it turns out, indeed! Just make them! Super easy. 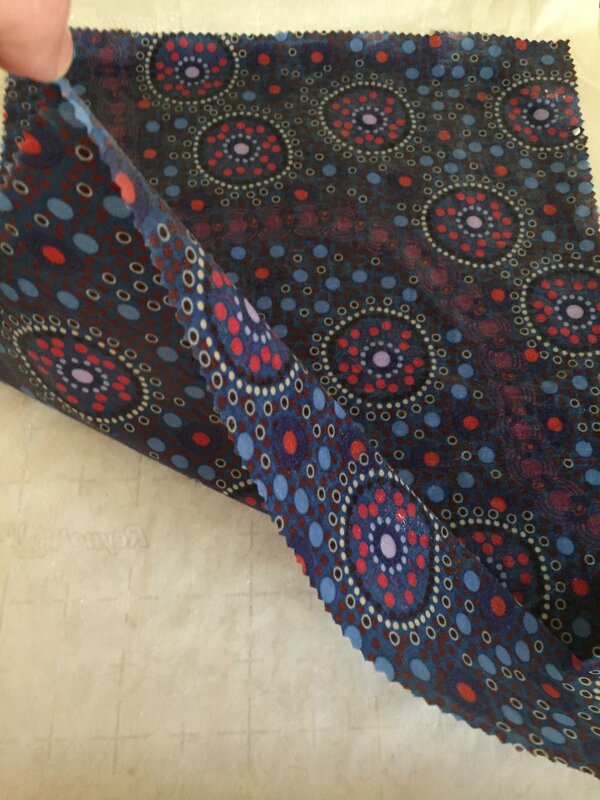 If you're like me, you likely have a lot of random bits of fabric lying around from various sewing projects, and beeswax wraps are a delightful way to use them up. The wraps are an eco-friendly, re-usable alternative to tin foil or saran wrap. Use them in the same way you would use either of those options, by covering a plate/bowl or by placing the food directly in the wrap and closing it up. The beeswax forms a protective seal so that moisture doesn't pass through to the fabric, and the wraps adhere to the shape you mold them into when you use them. It's pretty much magic! Some available recipes are more complicated than others, and now that I am hooked on the wraps, I plan on trying every single one. When I made the first batch of wraps, I happened to have all the ingredients and tools needed in the recipe featured on Apartment Therapy, so I went with that. Start to finish, I made four wraps in under an hour, prep and clean up included. Not too shabby! For there recipe, all that was needed was a cookie sheet, parchment paper, a paintbrush, fabric, shearing scissors, and beeswax shavings/pellets. 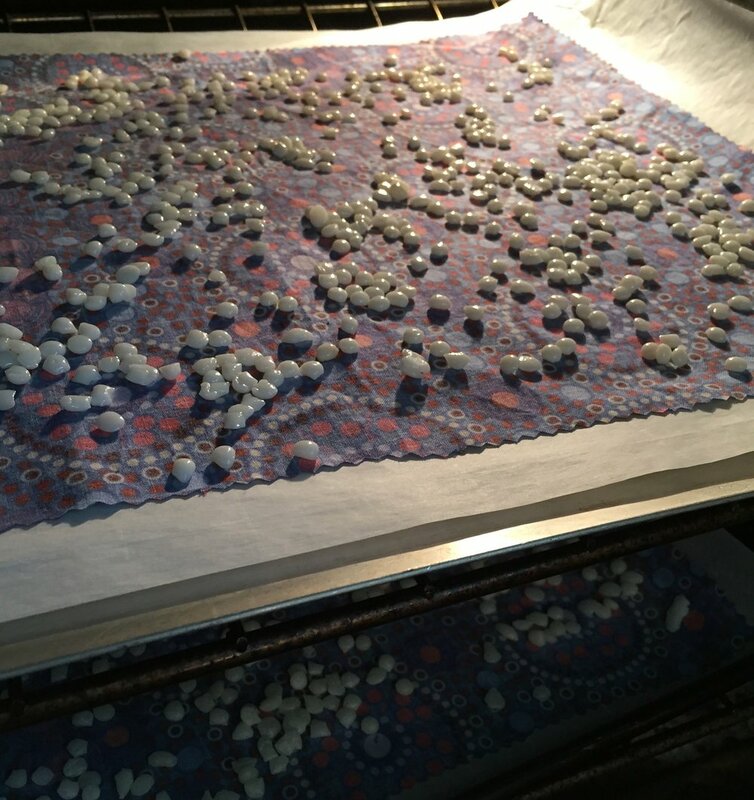 After cutting the fabric to the desired size, the next step was to place the parchment paper on the cookie sheet, and then the fabric on the parchment paper. Spread some beeswax evenly on the fabric (see photo), and place the whole things in your oven on the lowest setting. I started getting impatient so I eventually upped the temp to 200 degrees (Fahrenheit), and I kept opening the door to check on melting status, spreading around the beeswax as it turned liquid. Making two at a time, I staggered their placement in the oven by a few minutes, as the whole process was likely somewhere between 5-7mins per wrap. Once I pulled out a wrap that was evenly coated with the wet wax, I waited just a moment or two before pulling it up by a corner (being careful not to burn myself) to let the excess wax drip off. For some of my wraps, I had almost none. Finally, I let the wrap cool completely by draping it over the back of a chair. It was ready to use almost immediately. My husband and I have a fair amount of food preservation paranoia, but we are both happy to report the wraps work great! Once used, they can simply be raised with soap and water and put away until used again. Beeswax wraps fans do caution against using the wraps to hold uncooked meats, as you can't exactly sanitize them, but we use them for everything else: veggies, fruits, leftovers, cheese! They store easily and last a good long stretch (8-9 months looks ike it is the upper limit, depending on use). Such a simple way to get rid of the disposable options and move toward a more natural and re-usable option!